Florimond Ronger, known to the musical and theatrical world simply as Hervé, was one of the great characters in, and one of the moving influencers and inspirers of the course of, the French and world musical theatre in the 19th century. 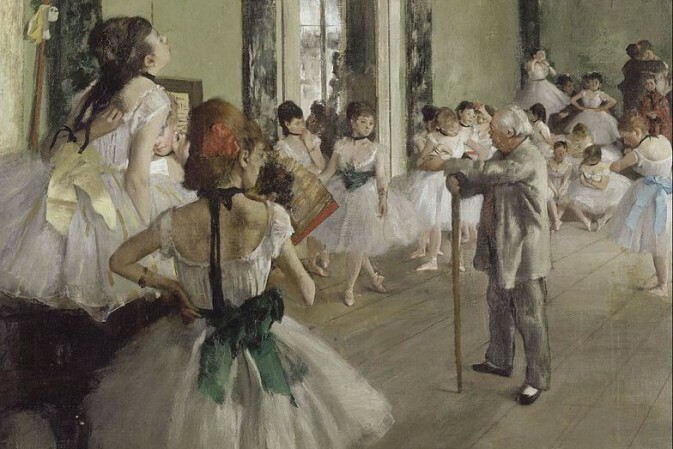 It was he who was at the root of the tradition of opéra-bouffe which developed in France in the mid-19th century, as an author, a composer, as a theatre manager and even, on a variety of occasions, as a performer. And, in a career which included more than the regulation amounts of ups and downs, he was still around more than 30 years on to take a significant part in an important wave of wholly different musical plays, the vaudevilles or musical comedies produced at the Théâtre des Variétés in the late 1870s and early 1880s, a series which gave their composer a second and highly popular `tour du monde’ of successes. Born in the Pas de Calais near Arras, the son of a French gendarme and his Spanish wife, Hervé lost his father at the age of ten. His mother moved to Paris, and there the child became a choirboy at Saint-Roch whilst following a regular course of musical studies, which allowed him, as a young teenager, to become organist at the chapel of the mental asylum at Bicêtre. During his time in this post he began to work musically with the asylum’s inmates, setting up an orchestra and, in 1842, writing a little opérette, L’Ours et le pacha, based on the popular vaudeville by Scribe and Saintine, for his pupils to perform. He subsequently became organist at Saint-Eustache and also, around the same time, made his first appearances on the professional stage, working as a comedian and vocalist in several of Paris’s suburban theatres. In 1848, Hervé the performer, the writer and the composer concurrently made their first notable appearance on the Parisian stage when the young man wrote, composed and played in a little two-handed saynète devised as an occasional piece for the short, stout actor Désiré, and his tall, gangling self in the rôles of a burlesque Sancho Panza and Don Quixote. Don Quichotte et Sancho Pança, played subsequently for a run at Adolphe Adam’s Théâtre National, has been generally quoted, in retrospect, as being the starting point for the new French musical theatre tradition. Hervé, still doubling as church organist and theatrical writer and performer, went on to appointments as chef d’orchestre at, respectively, the Odéon and the Palais-Royal. There he duly turned out a number of other little musical playlets — variously described in such terms as vaudeville-opérette, parodie-opérette or opérette-bouffe — and of wordless pantomimes to be played on the composite programmes which made up the habitual bills at those houses. It was, however, his burlesque (`fantaisie bouffe’) Les Folies dramatiques, an extravagant five-act parody of all things theatrical which had a strong flavour of the topical revue about it, which gave him his first important impetus. The show aroused the interest of the powerful and stage-struck Duc de Morny, and in consequence Hervé was offered a position under royal patronage. He asked, instead, for permission to operate a theatre, and as a result the Folies-Concertantes (soon renamed the Folies-Nouvelles) was opened under his management in the Faubourg du Temple in 1854. Hervé himself was the main supplier of the quickly turning-over repertoire played at his little theatre, writing and/or composing more than 30 short musical playlets, pochades, vaudevilles and pantomimes during the first three years of his operation. However, he also encouraged and mounted works by other composers, amongst whom the young Jacques Offenbach — in whose early Oyayaye Hervé took the travesty title-rôle — and Léo Delibes, whose music the manager interpreted in such pieces as the little two-hander Deux sous de charbon (Bigarreau), were prominent. Hervé took part, in fact, in a large number of his own productions, playing opposite Joseph Kelm in the title-rôle of the `autobiographical’ Le Compositeur toqué (Fignolet), and in such other little pieces as La Belle Espagnole and La Fine Fleur de l’Andalousie. In 1858 the multiple workload became too much for the producer-house author-star performer of the Folies-Nouvelles. Hervé fell ill and had to leave his theatre. He went abroad, touring around, taking employment where he could and would, and spending some time as musical director to the theatre in Cairo, before finally returning to Paris to take up posts first as musical director at the Eldorado, where he turned his hand to supplying the vast number of songs needed for the ever-changing programmes of a café-concert, and then at the Délassements-Comiques, for which he composed a further run of the musical playlets and scenes which he had favoured at the Folies-Nouvelles. During Hervé’s absence, however, the musical theatre in Paris had taken strides ahead. Offenbach had produced his famous full-length opéra-bouffe, Orphée aux enfers, and in 1864, whilst the Théâtre des Variétés mounted Hervé`s winning one-act Le Joueur de flûte, they also premièred Offenbach’s sensational three-act La Belle Hélène. Hervé, whilst still continuing his parallel career as a performer, soon followed Offenbach into the field of the full-length opéra-bouffe. His mock-Arthurian Les Chevaliers de la table ronde, composed to a text by Chivot and Duru, eased him into the genre with a medium ration of of success, and the following year he topped it with a loopy burlesque of William Tell, Robin Hood and of anything else in flight, for which he himself supplied the text. L’Oeil crevé scored a major success in Paris and was soon exported around the world. Chilpéric, the next year, saw Hervé, the librettist and the composer, in his very top form. This burlesque of things medieval won him a second triumph, compounded this time by a triumph as a performer, for Hervé himself starred in the title-rôle of his thoroughly crazy opéra-bouffe, introducing the famous horseback Chanson du Jambon and the dippily echanting Butterfly Song in his character as the mad Merovingian monarch. His third major work, Le Petit Faust, came out only months later. 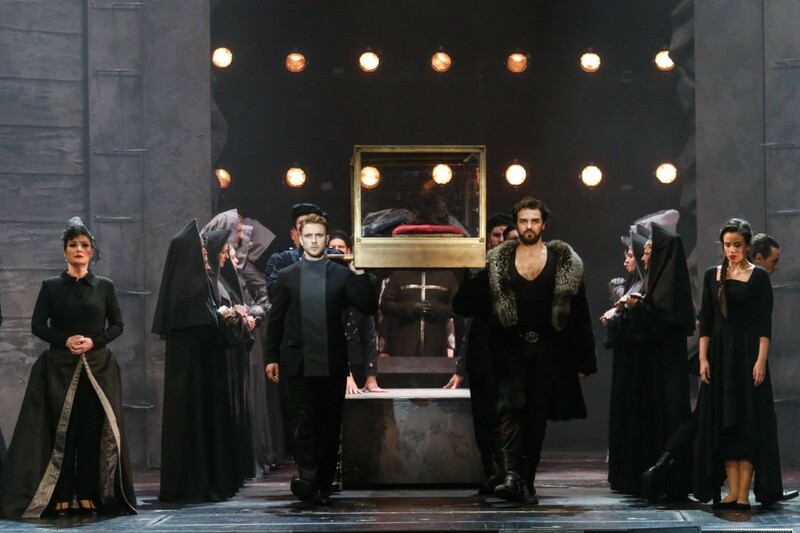 Once more, Hervé the composer and Hervé the actor — appearing here in the dual rôle of the young and the aged Faust — scored a major hit, and Le Petit Faust proved to be internationally the most popular of all his pieces to date. Offenbach, who had turned out Barbe-bleue, La Vie parisienne and La Grande-Duchesse de Gérolstein, in the same period and Hervé were now at the peak of their glory, and the Parisian stage was the centre of the musical theatre world. Adolphe Jaime and Hector Crémieux, the librettists of Le Petit Faust, supplied Hervé with the text for the less successful Les Turcs, but this time Hervé did not appear in his show, for he made his way across the Channel to Britain and there, as the Franco-Prussian war raged at home, he introduced London to English versions of, first, Chilpéric and then Le Petit Faust. London was stunned by Chilpéric (with Hervé starred), rather less by Le Petit Faust (in which he decided not to play), and opéra-bouffe in its genuine shape and form was launched on the English-language stage. Hervé stayed several years in Britain, during which time he not only appeared as Roland in London’s performances of Le Chevalier de la table ronde (Gaiety 1871), in Le Compositeur toqué and eventually as Faust in a productin of Le Petit Faust, but also turned his composing talents to supplying the emerging British opéra-bouffe with one of its earliest substantial scores in the Gaiety Theatre’s parody of the Aladdin tale, Aladdin II. 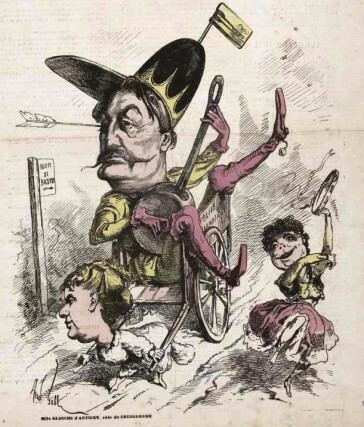 He also contributed musically to the vast spectacle that was Dion Boucicault’s Babil and Bijou at Covent Garden, and to the Covent Garden pantomime of 1870, The Sleeping Beauty, or Harlequin and the Spiteful Fairy (w Betjemann/Gilbert a’ Beckett, C H Ross). At the same time, however, the indefatigable writer continued to hold up a presence in Paris, where another extravagantly burlesque piece, the Scottish saga Le Trône d’Écosse (et la difficulté de s’asseoir dessus), had a fairly successful run. After Hervé’s postwar return to Paris, things went, at first, rather less well.. The end of the Empire had more or less spelled the end of opéra-bouffe and its crazy follies, and Hervé’s surreal, imaginative style was no longer what the public demanded. His La Veuve du Malabar, with Hortense Schneider starred, and Alice de Nevers, in which he himself took the rôle of the Prince de Ferrare alongside Milher, Marie Périer and Marie Desclauzas, were not successes, and if Hortense Schneider’s impersonation of La Belle Poule and La Marquise des rues (68 Paris performances and an Hungarian showing as Az utszéli grófkisasszony) did a little better, it seemed that the composer had now passed his most popular days. When he again took to the stage as an actor in one of someone else’s shows, it was in a pre-war piece, in the rôle of Jupiter in Offenbach’s revival of his early Orphée aux enfers (Gaïté, 1878). 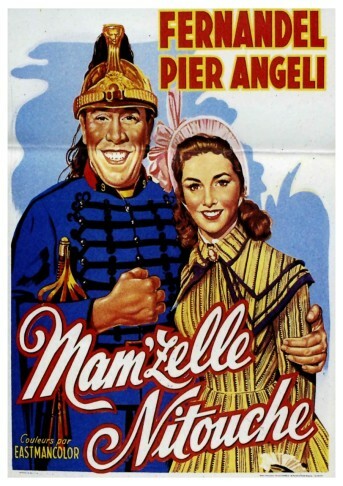 Poster of a film version of the ever-popular “Mam’zelle Nitouche”. However, renewed success arrived before the end of the decade. The Théâtre des Variétés had enjoyed a great success with the vaudeville-opérette Niniche, with Anna Judic starred in its oversized title-rôle and a ‘pont neuf’ score put together by Marius Boullard. Manager Bertrand decided to continue with more productions in the same vein, and it was Hervé to whom he went for the scores for the three subsequent pieces (and a share in the fourth, La Roussotte), conceived and written in a similar vein, with which the star and the theatre triumphed in the years that followed. La Femme à papa, with its famous `Chanson du Colonel’, Lili and the enduring Mam’zelle Nitouche brought Hervé three of the biggest successes of his long career, with the last two pieces, in particular, surviving into revivals long after virtually all of his rather more special opéras-bouffes had virtually vanished from the repertoire. With La Cosaque, the vogue for vaudeville-opérette passed, but Hervé continued to write for the musical stage. There were, however, no further hits, and several echoing flops, after the last of which the composer put down his pen, left Paris and returned to England, where he became musical director and conductor at the Empire Theatre. 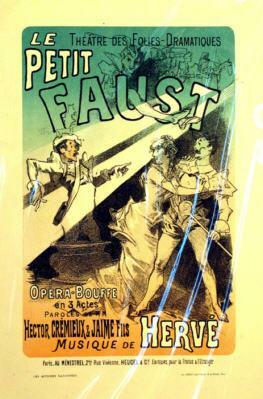 He rarely returned to France in his last years, and although he composed several ballets for his London house and possibly a three-act comic opera called Frivoli (1886) staged at London’s Theatre Royal, Drury Lane, under the name `Louis Hervé’ (which may, perhaps, actually have been the work of his son) with a fine cast but a short run, only a small handful of further Hervé compositions, the last posthumously, were produced in Paris. It was in Paris, however, that he died at the age of 67 after an asthmatic attack. His son Louis Emmanuel Florimond RONGER (b Paris, 28 January 1847; d nr Paris, 18 July 1926), professionally known as GARDEL[-Hervé], had an eclectic career in the theatre. He worked as a performer, playing Médor in his father’s Les Chevaliers de la table ronde and opposite Hervé in the little Le Compositeur toqué in both Paris and London (1871),and featuring in the Paris production of Le nouvel Aladin (1893, Roi Lallali) as Raab in La Timbale d’argent, Le Rougeaud in L’Auberge du Tohu-bohu etc; in management (for a period director of the Menus-Plaisirs), as a stage director (notably at the Théâtre de la Gaîté and at the Eldorado) and also as an intermittent author and composer. He wrote and/or composed several small musical playlets (Un Choriste amoureux [Folies-Nouvelles 23 December 1871], Dans le bain [w Hermil, Eldorado 7 April 1873], Le Roi Topino [Excelsior 18 November 1898], Le Brasseur [Variétés, 18 April 1896], La Demoiselle de chez Maxim [Parisiana, 2 March 1899], Les Aventures de Télémaque [w Hervé, Scala, 9 March 1900], Les Filles de la belle Hélène [w Goublier, Eldorado, 6 January 1900], La Môme Grenouille, Le Voyage d’amour etc), burlesques, revues, ballet scenarii, sketches, vaudevilles, and even dramas.